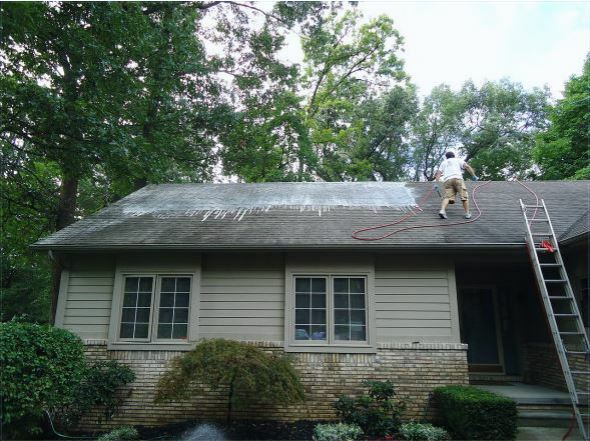 Our Local Roof Cleaning Services involves an application being applied to the roof’s infected areas and rinsed off after about an hour dwell time. Your roof may easily be the most valuable part of your home’s exterior and yet is often the most neglected. Algae, moss, mold and dirt can build up and erode the shingles, diminishing the lifetime of your roof surace and causing general unsightliness. Don’s Power Washing and Roof Cleaning uses a very gentle, environmentally responsible detergent and lets it soak for 30 minutes to an hour so that it can pull out the dirt and break down the algae.